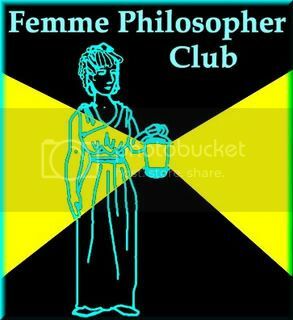 My good friend jugglingpaynes has created a new award for Femme Philosophers! "I've been lucky to find a number of women here and in real life who challenge me to think, but also offer me a secure sounding board. I know they will still be friends even if our ideas differ. It's not as important to me that they agree, just that they are as respectful of my opinions as I am of theirs." "If you are awarded the Femme Philosopher, you are now able to stick a Femme Philosopher button on your blog. If you are savvy of these things (I'm not) you can also link it on the post that won it for you. Copy these rules to include on your post so that others will know what it's about. Now you are free to give this award to others! Along with blogs you agree with, please look for blogs that are not necessarily your views, but rather ideas that stir thought and allow for respectful discussion in their comments. We cannot stimulate our own thought processes without running up against some opposing views. (With this in mind, it is not necessary for the Femme Philosopher to be femme. It's named for the femmes that started it.) Use it as often as you like or not at all (killjoy). I want to start things off by awarding a button to MOMflippedisWOW at her Balderdash & Blokus address. She inspires my thought be it through boiled frogs or patriotic spam. Congratulations, my friend, go forth and inspire others to think outside of their comfort zone."